Flow requires a certain amount of focus, and when that concentration is broken by pesky colleagues, work can suffer, on top of time wasted attempting to re-engage with the task at hand. The Technical Lead in [Estera Dezelak]’s office got fed up with being interrupted, and needed his own personal assistant to ward off the ‘just one question’-ers. Initially, [Grega Pušnik] — the tech lead — emailed the office his schedule and blocked out times when he wasn’t to be disturbed, with other developers following suit. When that route’s effectiveness started to wane, he turned the product he was working on — a display for booking meeting rooms — into his own personal timetable display with the option to book a time-slot to answer questions. In an office that is largely open-concept — not exactly conducive to a ‘do not disturb’ workstation — it was a godsend. [Bigelow Brook Farm] has a cool geodesic dome greenhouse that needs to stay warm in the winter. There are a lot of commercial solutions for greenhouse heating, but if you’re the kind of person who research and develops solutions for aquaponics, a greener solution may have more appeal. A rocket mass heater is a combination of a rocket stove and underfloor heating. A rocket stove works by having such a strong draft created by the heat rising up the chimney that the flames can’t crawl up the fuel and burn in the open air, creating a controlled burn zone. Unfortunately, with just a plain rocket stove a lot of heat is lost to the atmosphere needlessly. You only need enough to create the draft. The mass part solves this. It runs the exhaust under the floor and through radiators. This passively retains a lot of heat inside the space to be heated. It’s a bit of a trick to balance the system so it puts as much heat into the space as possible without stalling, which can be dangerous due to carbon monoxide, among other things. Once the balance is achieved the user gets a stove that can burn fuel very effectively and best of all passively. [Bigelow Brook Farms] have been working on their heater for quite some time. We really enjoy their test driven development and iteration. They have really interesting autopsies when a component of the heater fails and needs replacing. Right now they have a commercial sized operation heated by their latest iteration and it’s completely passive, being gravity fed. Video after the break. [mfaust] wakes up in the morning like a regular person, goes to work like a regular person, types in tedious commands for his software versioning utilities like a regular person, and then, as a reward, gets his coffee, just like rest of us. However, what if there was a way to shorten the steps, bringing us all closer to the wonderful coffee step, without all those inconvenient delays? Well, global industry is trying its best to blot out the sun, so mornings are covered there. [Elon Musk’s] thinktank proposed the hyperloop, which should help with the second step. [mfaust] built a control station for his versioning software. Raise your cup of joe high for this man’s innovative spirit. He first laid out all the buttons, LED lights, and knobs he’d like on a panel to automate away his daily tasks. Using photoshop he ended up with a nice template. He laminated it to the top of a regular project box and did his best to drill holes in the right places without a workshop at his command. It’s pretty good looking! Since this is the sort of thing an Arduino is best at he, in a mere two tries, wired everything up in such a way that it would all cram into the box. With everything blinking satisfactorily and all the buttons showing up on the serial out, he was ready for the final step. Being a proficient and prolific enough developer to need a control panel in the first place, like a sort of software DJ, he wrote a nice interface for it all. The Arduino sits and waits for serial input while occasionally spitting out a packet of data describing its switch status. A Java daemon runs in the background of his computer. When the right bits are witnessed, a very nicely executed on screen display reports on the progress of his various scripts. Now he can arrive at the hyperloop terminal during the appropriate work time slot in Earth’s perpetual night. After which he simply walks up to his computer, flips a few switches, glances quickly at the display for verification, and goes to drink some nice, hydroponically grown, coffee. Just like the rest of us. If you haven’t jumped on the ESP8266 bandwagon yet, it might be a good time to get started. If you can program an Arduino you have pretty much all of the skills you’ll need to get an ESP8266 up and running. And, if you need a good idea for a project to build with one of these WiFi miracle chips, look no further than [Ben Buxton]’s dated, but awesome, NTP clock. Can you make a spectrometer for your home lab all from materials you have sitting around? 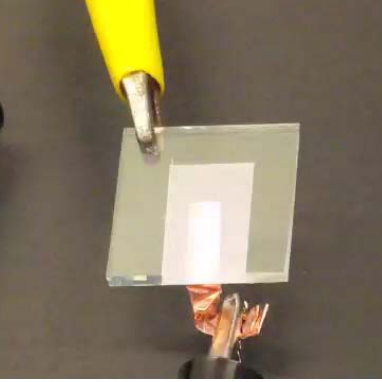 We might not believe it from a less credible source, but this MIT course does indeed build a spectrometer from foam board using two razor blades as the silt cover and a writable CD as the diffraction grating. The coolest part is removing the metal backing of the CD. Hackaday reader [gratian] tipped us off about the course available from MIT courseware called Nanomaker. It boils down some fairly complicated experiments to the kind one can do in the home lab without involving thousands of dollars of lab equipment. The whole point is to demystify what we think of as complicated devices and topics surrounding photovoltaics, organic photovoltaics, piezoelectricity and thermoelectricity. Spectrometers are used to analyze the wavelengths of a light source. Now that you have a measurement tool in hand it’s time to build and experiment with some light sources of your own. Here you can see an LED that is the topic of one of the course labs. If you have a bit of background in chemistry this is a good step-by-step guide for getting into these types of experiments at home. It reminds us of some of the really cool stuff [Jeri Ellsworth] was doing in her garage lab, like making her own EL panels.